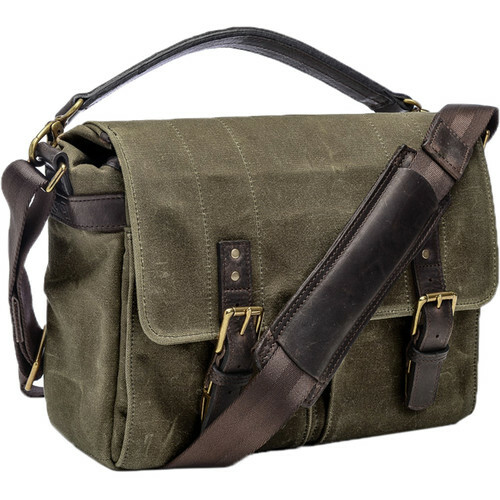 Designed to hold a DSLR, rangefinder, or mirrorless camera with an attached lens and 2 extra lenses, the Prince Street Camera Messenger Bag in olive from ONA also has room for an 11" laptop or tablet. It offers a streamlined back pocket for documents, magazines, or thin books, and dual front pouches for accessories, such as your smartphone, memory cards, or batteries. The bag has a fold-over front flap secured by two belt-like straps with antique brass buckle closures. Padded interior dividers allow you to customize the organization and placement of your gear to your liking. Convenient rain-diverting side flaps keep your valuable equipment protected from the elements. The Prince Street is carried via the adjustable shoulder strap with comfort pad or the slim, removable top grab handle. It's handcrafted from water-resistant waxed canvas with full-grain leather details for durability and style.